Come to the dark side. Add a sinister blacked-out look without changing the distinctive style of the Fat Bob® motorcycle. The Original Equipment slotted wheels are finished to a deep gloss black luster, and then meticulously machined to expose the raw aluminum below. The contrasting aluminum beveled edge slots and accent spots add a genuine custom look without compromising strength or performance. 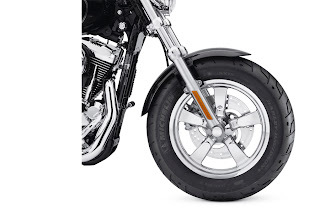 All Genuine Motor Accessory wheels have been certified by Harley-Davidson® to perform to our tough vehicle standards for quality and durability. Requires separate purchase of model-specific Wheel Installation Kit. Fits '08-later FXDF and FXDFSE/2 models. Add a splash of chrome without changing the distinctive custom style of your Sportster®. More than just a chrome-plated Original Equipment wheel, these 5-spoke wheels utilize tooling developed specifically for chrome-plating to give a near perfect finish without the "waves" created when polishing the Original Equipment cast wheel. Countless hours of polishing result in a superior finish. Special masking was developed to prevent plating corrosion inside bolt holes and bearing sleeve areas. 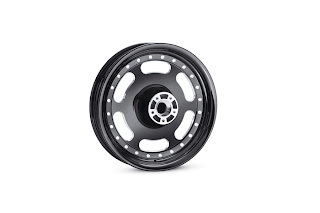 All Genuine Motor Accessory wheels have been certified by Harley-Davidson® to perform to our tough vehicle standards for quality and durability. Requires separate purchase of model-specific Wheel Installation Kit.